I love that Thanksgiving traditions are so similar and yet can be so unique and different in every home across the nation. Yes, we all gather with friends and family on the same day, and usually all have turkey, but the best way to make said turkey (fried, smoked, oven roasted) and the sides that go with it, can vary from region to region. 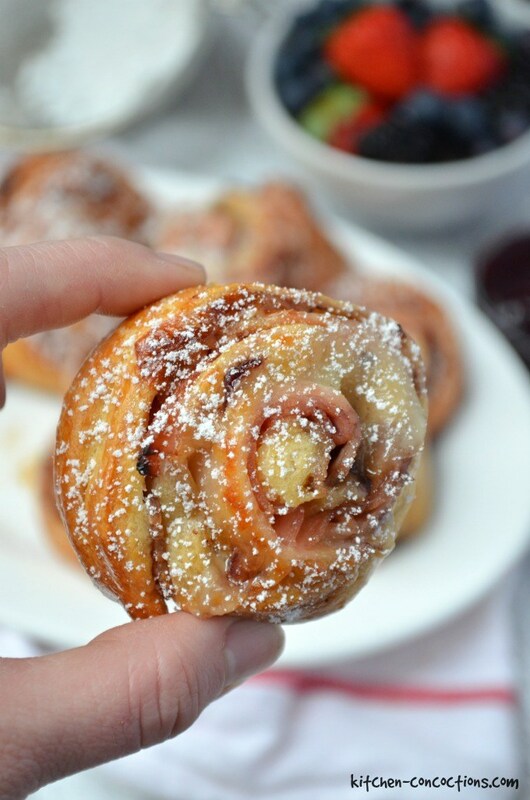 Inspired by a popular sandwich, these baked Monte Cristo Pinwheels, are sweet and savory will definitely be your go to appetizer recipe all season long! Preheat oven to 375 degrees F. Line a baking sheet with foil or parchment paper and set aside. Unroll dough into four rectangles pressing together the perforations. Spread a thin layer of the fruit spread over each dough rectangle. Top fruit spread with two slices of cheese, one slice of turkey and one slice of ham. Starting at the short side of the dough, roll up dough sheet into a long log shape. Using a serrated knife, cut each roll into approximately 5 slices. Arrange slices on a baking sheet. In a small bowl, whisk egg. Brush egg over raw pinwheels. Bake pinwheels in a 375 degrees F for 10-12 minutes or until golden brown. Immediately remove from baking sheet and transfer to a serving plate. Pour powdered sugar into a small mesh colander and dust the pinwheels with powdered sugar. Serve warm with additional Smucker's Fruit & Honey Triple Berry Fruit Spread for dipping. 0 Response to "MONTE CRISTO PINWHEELS"